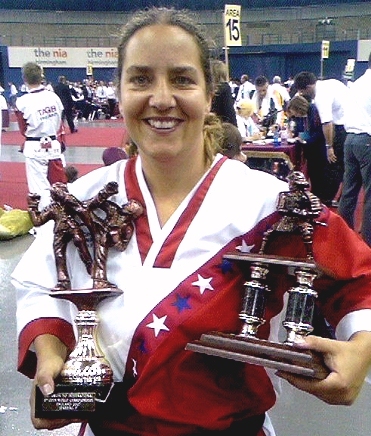 2008 NOMINEE FOR INDUCTION / OFFICIAL TAEKWONDO HALL OF FAME®. Annabel Murcott recently became the first female to be promoted to 6th Degree by the T.A.G.B. the experience would do her good. Little did she know she was to become the youngest W.A.K.O. the ladder. Since then she has fought for England abroad and at home on numerous occasions. Mr David Oliver 7th Degree, for her outstanding achievements and dedication for 2002. Self Defence in Secondary Schools during the day. currently a nominee for induction into the Official TAEKWONDO HALL OF FAME ®. 1999 English Championships Bronze Sparring. 2000 British Championships Silver Patterns. 2000 BTC Championships Silver Sparring. 2001 English Championships Silver Patterns. 2003 German Euro Cup  Represented England to Referee. BACK TO THE TAEKWONDO HALL OF FAME®.